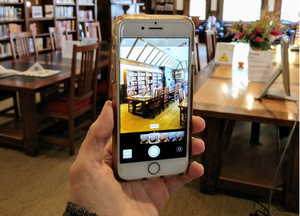 Southport, CT - Pequot Library will be offering a three-week long iPhone Digital Photography Workshop on Wednesday 2/6, 2/13 and 2/20, from 9:15-11:45am. Discover the power of the phone in your pocket! Learn how to use your iPhone or iPad* to make lasting memories. The sessions are led by iPhone photography expert Julie Stauffer. During this three-session, hands-on workshop, you'll uncover the vast technical capabilities of your electronic device, become comfortable taking photographs, master various camera and editing apps, and make your photos go from good to great. Workshop fee: $200. Registration required. Julie Stauffer is a leading iPhone photography expert who has taught workshops throughout Connecticut, New York, Maryland, Pennsylvania, and Washington, D.C. Her combined experience as a photographer and iPhone expert makes her well equipped to bridge the disciplines of art and technology. She has a gift for meeting you right where you are, enabling you to master your device and gain the editing skills you need to translate your photo from a quick pic to an image that has lasting value.